Dandruff can damage hair and eventually, lead to hair loss. Here's how to stop that happening and restore your hair by keeping your hair and scalp healthy. 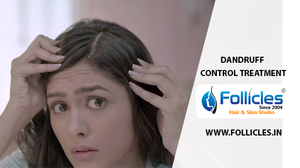 Follicles Hair & skin Studio give best dandruff treatment in Hyderabad & controls hair fall.